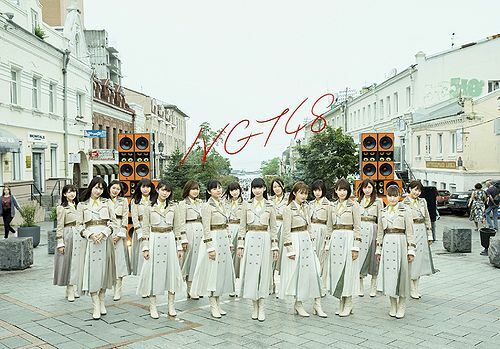 Discussion in 'NGT48 News & Releases' started by ForrestFuller, Jul 9, 2018. 4A) NGT48 Kenkyuusei Short Movie "Mijikai Natsu yo, Sayonara -Fountain-"
4B) NGT48 Kenkyuusei Short Movie "Mijikai Natsu yo, Sayonara -Garden-"
4C) NGT48 Kenkyuusei Short Movie "Mijikai Natsu yo, Sayonara -A figure-"
Also announced during today's theater show, a release event for the 4th single is set to be held at the Nippon Budokan on September 15th! It seems like they are trying to do things big this time. Though guessing it will be Ogiyuka, and I'll be really angry if it's Nakai. Seeing how NGT takes the SSK so much into consideration (Ogiyuka and Hinatan being center), I wouldn't be surprised (and I really hope it's true) if we got a front line of Katomina, Gatanee and Nara. Draft unit with Ogiyuka and Gatanee introducing the D3 girls? New single!! I hope Katomina or Gatanee will be the centers, or maybe both of them WCenter, and a large senbatsu like last single. The intrviewed dude is Koasaka Daisuke, he is the ROCKIN'ON JAPAN editor in chief whith whom they will collaborate for their participation at ROCK IN JAPAN FESTIVAL 2018. They have a performance on 08/04. Argh there goes my money! I will be in Japan in October..... so no theatre performances?! Edit 20180710: I want a good rotation of centers. Are they going to showcase the song at Rockin Japan? Katomina to be the center & Ogiyuka to get a solo song! I hope NGT wota will spend money this time. I don't think i really mind who centers this time. Katomina centering would be nice (or Monica...I'd be cool with that lol). YAYY I'm pumped!! A double center with Ogiyuka/Hinatan would be a dream team! But also a Gatanee or Katomina center, either one of them would be really great! Hope we can get those sales up this time and get a good quality MV! Can anyone give a summary on what the Rockin On Japan Editor in Chief was saying and why he was being interviewed for NGT's next single lol like is he actually going to be involved in the next single somehow or is it just a little collab for Rock in Japan Festival? a katomina center would be nice. it'll be her reward for improving her ranking at ssk and also to give her push another try and see if it sticks this time around. I'd love to see the management giving Ogiyuka a rap somewhere, just for the lols. I think the center will be Yuka or Gatanee.